"Caravan" is the kind of song that can start a fire at a jam session. Over the years, drummers have played the Duke Ellington tune with a pile-driving rhythm, the tension breaking for a brief moment halfway through the theme. Built on a minor-key riff, the piece can easily capture a soloist in its frenzy, and an audience as well. And that, it's obvious, is what's going to happen tonight at Interval, the Monday night jazz jam at East Liberty hotspot Ava. Drummer Dave Throckmorton and bassist Tony DePaolis have already been shooting off sparks for nearly two sets with house keyboardist Howie Alexander, when "Caravan" is called. A few horn players solo on the tune before trumpeter Sean Jones takes center stage. Standing around 6 feet tall with a muscular build, his dress matches the informal feel of the evening: a ball cap, loose-fitting denim jacket and slacks. Jones, who teaches jazz studies at Duquesne University, stands still, looking forward but picking up the vibe of the rhythm section. He could easily take the mood up another notch to start his solo. But he has something else in mind. He starts by playing quietly, pulling back on the dynamics. Instead of disrupting the flow of "Caravan," he's added a level of suspense. "I wait until the band finds out how they want to create this path, then we go there together," Jones explains after the performance. The audience, a cross-section of generations and races, stands three-deep at the bar, and most of them are giving Jones their undivided attention. Those sitting along the wall aren't moving either. By his second chorus, Jones is rumbling through his horn -- not like the old-time growlers who once played this tune with Ellington, but in a way that builds on the contemplation of his opening statements. As his solo reaches its climax, Jones blows some bright licks in the trumpet's upper register. There might be shades of Dizzy Gillespie in his bright tone, or maybe a bit of Freddie Hubbard, the recently deceased trumpeter known for his stratospheric leaps. In any case, everyone in the room knows that Jones can construct a solo that, as the saying goes, "tells a story." Loud appreciation follows, just as it has followed Jones through much of the past 10 years. A native of Warren, Ohio, Jones has released five inventive albums, and worked with several jazz heavyweights, some of whom have taken him on tours around the world. But thanks to his job at Duquesne, the 30-year-old remains in Pittsburgh, a city where the best things about local jazz music are often discussed in past tense. Jones is trying to change that, however. As a musician, he connects to the past masters, but adds a contemporary flavor without sounding slick or commercial. As an instructor, Jones similarly encourages his students to learn classic jazz, while developing their own voices. And as the crowd at Ava has shown, he's focused on creating another generation of jazz listeners, too. Growing up in Warren, Jones first picked up the trumpet in the fifth grade -- and it took a few weeks for him to figure out how to get a sound out of it. From there, though, his learning curve was steep. Jones discovered jazz through a band instructor who turned him on to two Miles Davis albums: the acoustic Kind of Blue from 1959 and the electric Tutu from 1986. While the albums are vastly different, both offer mind-expanding possibilities for improvisation. Jazz wasn't the only thing to shape Jones' musical perspective. He sang in the choir at St. James' Church of God in Christ, and a gospel feeling still permeates his music. That dovetailed perfectly with his affinity for hard bop, the funky 1950s jazz style whose harmonies and rhythms also drew on gospel roots. 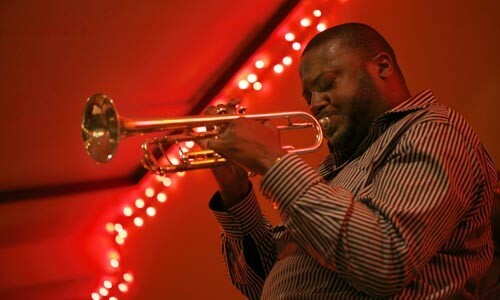 Jones attended Youngstown State University, where he earned a bachelor's degree in classical trumpet performance. But he was also honing his improvisational chops in live performances -- and legends began springing up. Howie Alexander, the de facto ringmaster at Interval, first heard Jones when they played together in Warren, a few years before the trumpeter came to Pittsburgh. "I figured it was probably Sean's trumpet, 'cause he was blowing fire in his horn," he says. "After that gig, having that happen, it gave us all a brotherly bond." "He had sound, tone and ideas for days," agrees Paul Thompson, the regular Interval bassist who recalls playing with Jones during a Youngstown show in 1997. "Back then, I could tell he was very influenced by Freddie Hubbard. Now his ideas will come out of nowhere. What he plays will make even the most seasoned musicians go, 'Oh, my goodness, did he just play that?' He has this well of ideas that's never ending." In fact, along with Hubbard, Jones also identifies trumpeter Woody Shaw as an early inspiration. Shaw, who came to prominence in the 1970s, possessed a keen sense of melody and composition that required a lot of technique. "There was a point in time where I was all Woody Shaw," he says, in between scatting a flurry of notes to imitate Shaw's style. "But I really don't play that stuff anymore. I've taken Woody Shaw's concept and created new lines. " His efforts soon drew attention all the way from New York City -- and from one of the best-known names in jazz. At a club date in 2001, Jones walked off the stage after a solo and a friend handed him a cell phone. The voice on the other end complimented him on the trumpet solo he had just finished. Then the caller identified himself as Wynton Marsalis. Jones hung up, thinking it was a prank. But Marsalis called back and blew a complex trumpet lick into the phone for proof. When Jones apologized, Marsalis not only forgave him, he invited the younger trumpeter to visit him the next time he came to New York. Jones wound up in New Jersey attending Rutgers University, where he earned a master's degree in music performance, with an emphasis on jazz. But "it took me a year to call [Marsalis] up," Jones says. "I was so terrified." His timing paid off. When he finally made the call in 2004, the Jazz at Lincoln Center Orchestra needed a second trumpet for a summer tour. Marsalis pressured Jones to fill the recently vacated lead-trumpet spot, which he eventually took. The orchestra didn't just provide an opportunity to work closely with an institution like Marsalis: It also goes on month-long national and international tours three times a year. And nothing builds up a musician's strength like road work. "The reason that anybody in Miles' [Davis] band was as great as they were is not because they talked to Miles," Jones says. "It's because they were on the road and Miles got to train them on the bandstand. He'd thrown them curveballs in the moment. "I've learned a lot on the road with Jazz at Lincoln Center -- soloing and hanging, how to survive." 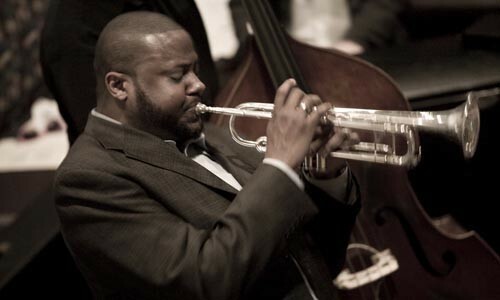 Jones had intended to stay on at Rutgers for a doctorate, but Marsalis hired him instead. And after Jones appeared as a soloist on an album by veteran band-leader Gerald Wilson, independent Michigan label Mack Avenue also agreed to release an album. That became Jones' first CD, Eternal Journey. And then Pittsburgh -- which had long been a frequent stop for jams -- lured Jones back with a steadier gig, a teaching position at Duquesne. "All in one year, I went from not having anything at all to having a salary," Jones says. "I thought, 'Can I go through life without a doctorate?' Ahhhhh ... yeah." In fact, when it comes to jazz, too much book-learning can be a bad thing. For the uninitiated, the success of musicians like Chris Botti and Kenny G can give the impression that jazz is little more than sanitized pop music. While some twenty- and thirty-somethings might know or even own Miles Davis' Kind of Blue or John Coltrane's A Love Supreme, these albums are both more than 40 years old. If jazz is a living, ever-evolving entity that is to continue taking shape each night, it needs an audience to help it grow. But if anything, jazz audiences have dwindled over the years, as original listeners get older and landmark jazz clubs like the legendary Crawford Grill close their doors. Universities such as Duquesne, whose School of Music features a half-dozen jazz instructors, help keep the flame. But musicians say there's only so far a classroom can take you. "The experience of jazz -- the lifestyle and all the things it takes to make it happen -- cannot come out of a simple codification of notes and chord changes," says Dr. Nelson Harrison, a trombonist often seen at jam sessions playing the trombetto (a reconfigured pocket trumpet whose range goes as low as a trombone). Harrison's lengthy career has included tours with the Count Basie Band, but he came up through the local jazz scene a half a century ago, long before jazz was taught at the college level. And while he's taught classes too, Harrison says they can't compare with on-the-bandstand training: "Hanging in the clubs and jamming in the clubs -- that makes you part of the community, because that's what makes you play the way you do. ... [W]hen you come down to our turf, that's when we break them down and really start to train them." Classroom studies need to be backed up with real apprenticeships, says Harrison, and Jones "is the only one that's doing it. That is really one of the most essential values that the jazz community needs, because we've lost our grassroots audience." In fact, while Jones makes his students learn classic solos the hard way -- transcribing them from CDs -- he also insists that they attend jam sessions at clubs as well. "The way you learn how to play jazz is you live it," Jones says. "You don't go to school and learn II-V licks and that's it," he explains, referring to the chord progression found in numerous jazz classics. "Jazz is improvisational chamber music, so you have to live and breathe with other people, share ideas and concepts and play off of other people in order to be an effective improviser." The challenge is obvious on a recent Wednesday evening, when Jones is leading an 18-piece big band made up of Duquesne students. Currently, they're working their way through an arrangement of Charlie Parker's bop classic "Donna Lee." The tune is one of Parker's most daunting works, with enough notes to leave most horn players gasping for breath. But the saxophones manage to make it through, and as students take their turn with solos, Jones stops conducting, letting the group fly on its own while he listens. The band seems to hit a comfortable groove, but he stops the music, pointing out that the rhythm section has rushed the tempo. He directs the students in a lighthearted but expectant manner, repeatedly reminding them to "get inside the bubble," his metaphor for the ensemble. "He's easygoing, but he makes sure that business is taken care of," says Mike Tomaro, director of jazz studies at Duquesne. "Sean is the first person to call on a student if they're trying to fake their way through things." Tomaro first brought Jones to Duquesne in 2004 as a guest soloist with the Duquesne University Jazz Ensemble. Following a part-time residency the following year, he was hired as a full-time professor of jazz studies. "When you look at the credentials that [Jones has] established in such a small amount of time, there's a possibility that a guy like that could be stand-offish and not want to work with anyone else," Tomaro says. "And Sean is the absolute opposite of that. He's the most cooperative person." In fact, now that he calls Pittsburgh home, Jones is committed to seeing the city get recognition for its contributions to jazz history. When he ranks it with New York, New Orleans and Chicago, he's dead serious. "C'mon, there'd be no hard bop without Pittsburgh. Period," he says. He points out that if you were compiling a list of pivotal jazz figures -- especially those who carved out the funky side of jazz -- you'd have to include native sons Art Blakey, Stanley and Tommy Turrentine and pianist Sonny Clark, just to name a few. Part of Jones' mission of giving Pittsburgh its due involves forming the Pittsburgh Jazz Orchestra. Made up of local musicians, the Orchestra will operate in a manner similar to the Lincoln Center unit, an advertisement for the city's legacy -- and future. "You go anywhere now and if people talk about Pittsburgh, they talk about people that either used to live here or they don't talk about what's going on now," Jones says. "We're going to try to give Pittsburgh the credibility that it deserves in the here and now." The ensemble doesn't plan to debut until later this year, but Harrison says the efforts made by Jones and others may already be paying off. "I haven't been to all the clubs, but from what I hear there's a growing jazz audience and it's seeking this musical experience," he says. "What they think is jazz is a label that will keep them from going to seek it out. Because they don't really know what it is. Once they get in the club door and they hear the real thing going on, they're hooked." Jones, says Harrison is "a true representative of the Pittsburgh spirit that made all the great musicians that came out of here. "Sean is a reincarnation of somebody." Harrison isn't the only musician to invoke the metaphysical when describing Jones, or the music he plays. Howie Alexander, the keyboardist at Interval, repeatedly uses the word "spirit" to explain what drives a player like Jones. "The spirit is a real thing to me," he says, and "Sean feels the spirit. He reaches really deep down inside to get what he needs, or goes really far out. It goes either way." In fact, it's no accident that Jones' latest album, released March 24, is titled The Search Within. "What did Thelonious Monk say? A genius is the person who is most like themselves," Jones says. "That's the genius of those guys in the '40s and '50s, they were such personalities," he says. "Those cats were characters. Back then it was cool to be yourself." And with Search, the trumpeter has created a body of work that reflects on the second decade of his life. "I really looked inside and surveyed myself," Jones says. "I tried to see what I did well and what I didn't do well in my personal and spiritual life. And with the music -- what are some of the things that did work and what are some of the things that did not work?" Search, in particular, moves through complex post-bop melodies to pensive ballads, with brief excerpts of the title track at the beginning, middle and end of the disc. Pittsburgh vocalist Carolyn Perteete returns from Jones' earlier work, Kaleidoscope, adding lyrics and vocals in "Letter of Resignation," an intriguing piece that sounds more melodically complex than many jazz songs that feature vocalists. Jones switches to the warmer flugelhorn on "Life Cycles" to create a rich texture with flute and harmonica. All of Jones' albums are programmed thematically. Gemini, his 2005 release, dug into his rhythm-and-blues roots; a year later Roots celebrated his gospel background. Kaleidoscope consisted of original compositions that incorporated a revolving set of vocalists. It's no accident that when downbeat magazine recently asked musicians to name their favorite album on Blue Note Records, Jones chose Herbie Hancock's Maiden Voyage, partly because the pianist set it up as a concept album. Every composition "serve[s] a purpose, and they all flow together," Jones says in the article. "After a while, you've just got to take a risk," he says. "And it takes a lot of honesty, man." It takes courage on the part of his label, too. "Everybody wants things that are outside the box, but when you give them something that's outside the box, they complain about it, and they want something that's packaged," Jones says. "I'm fortunate in that [Mack Avenue] is really supportive. They've never told me, 'No.'" In fact, Jones says, "I feel like I finally discovered the way that I want to write. I've tried to celebrate my post-bop influences with that gospel feeling. 'The Ambitious Violet' is a good example. It's a complex kind of tune, a waltz with a haunting melody. But at the end it goes into this vamp section that sounds like what you would hear at a gospel church." Assuming, of course, you need to go to church at all. "When he's not on a gig, [Jones] goes out to jam sessions," Alexander says. "I've asked him about it and he says, 'I've got to play or I'll go crazy.'" Any time you step up onstage, "There's a chance that you're going to go and reach that peak. You're going to find that moment. And there's nothing greater than that. And I think Sean believes that."